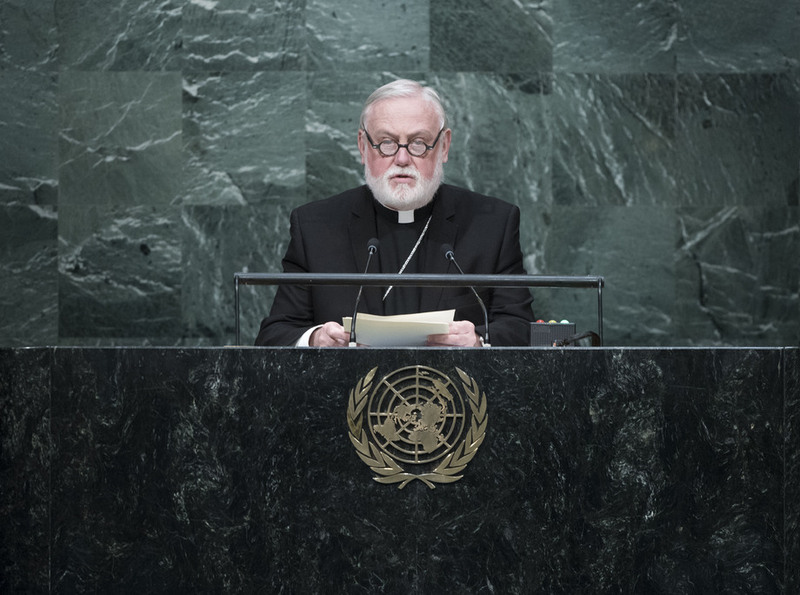 ARCHBISHOP PAUL RICHARD GALLAGHER, Secretary for Relations with States of the Holy See, expressed his satisfaction with the adoption of the 2030 Agenda, which Pope Francis had called an important sign of hope for humanity. In contrast to that hope, there was the “sad panorama of war”; without resolving those conflicts properly, all efforts to overcome poverty would fail. The world had before it the tragedy taking place in Syria, as well as troubles in Libya, Central Africa, the Great Lakes Region, South Sudan, Ukraine and the Middle East. Those issues must remain at the centre of the international community’s attention. It was a “bitter irony” that the seventieth anniversary of the United Nations was accompanied by the greatest exodus of peoples seen since the Second World War. In that regard, his delegation appealed to States to overcome every form of nationalistic self-interest and recognize the unity of the human family. On the responsibility to protect, he said that principle saved peoples from mass atrocities, instances of genocide, war crimes and other grave human rights violations. It was not always easy to carry out that responsibility in practice, not least because its observance often conflicted with a strict, literal interpretation of the principle of non-intervention. Due to the unacceptable human costs of inaction, the search for effective juridical means for the practical application of that principle must be among the central priorities of the United Nations. Similarly, he called on States to observe existing international law, which required a “genuine and transparent application” of Article 2 of the Charter. Article 2, however, could not become an alibi for excusing gross violations of human rights. Another core issue was disarmament. There was the telling example of the failure of the Review Conference of the Parties to the Treaty on the Non-Proliferation of Nuclear Weapons in May. In view of that impasse, it was important that the international community and individual States signal a real desire to pursue the shared objective of a world free of nuclear weapons. On climate change, he hoped that a fair, transformational and legally binding agreement would be adopted at the upcoming Climate Conference in Paris.